Looking to Optimize the Alarm System Performance of your Emerson DeltaV System? exida has formed a strategic alliance with Emerson Process Management to leverage exida’s alarm rationalization software SILAlarm™ and expert services to help customers improve the performance of their DeltaV alarm systems and comply with the ISA-18.2 standard on alarm management. Alarm System Performance Benchmarking (Initial) Establish initial baseline for ongoing comparison as part of a comprehensive alarm management program. Identify the most pressing alarm management problems and the biggest opportunities for improvement. 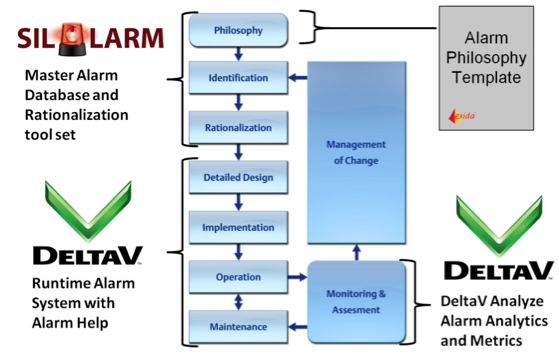 Alarm Philosophy Template - Starting point for creating a site-specific alarm philosophy that maximizes DeltaV functionality and creates a sustainable alarm management plan. SILAlarm™ - Tool for guiding the rationalization process and capturing results in a Master Alarm Database. Also creates alarm response procedures, populates DeltaV Alarm Help, and transfers alarm settings to DeltaV via Import / Export. Alarm Shelving (Manual Suppression) - Standard functionality in DeltaV Operate allows operators to temporarily suppress an alarm for a fixed period of time. DeltaV Alarm Help - Optional faceplates that display alarm help information to the operator in context. Populated automatically from the rationalization results stored and captured in SILAlarm (cause, consequences, corrective action, confirmation and time to respond). DeltaV Analyze - Tool for measuring alarm system performance, generating reports, and identifying poorly performing alarms (nuisance alarms, bad actors, alarm floods). In this class, attendees learn how to rationalize alarms for greenfield (new) or brownfield (existing) applications in order to optimize performance of their DeltaV alarm systems and address common alarm management issues. The class immerses participants in discussion and hands on exercises which have been designed to demonstrate the best practices for rationalization as taken from the ISA-18.2 alarm management standard and EEMUA 191 guideline. 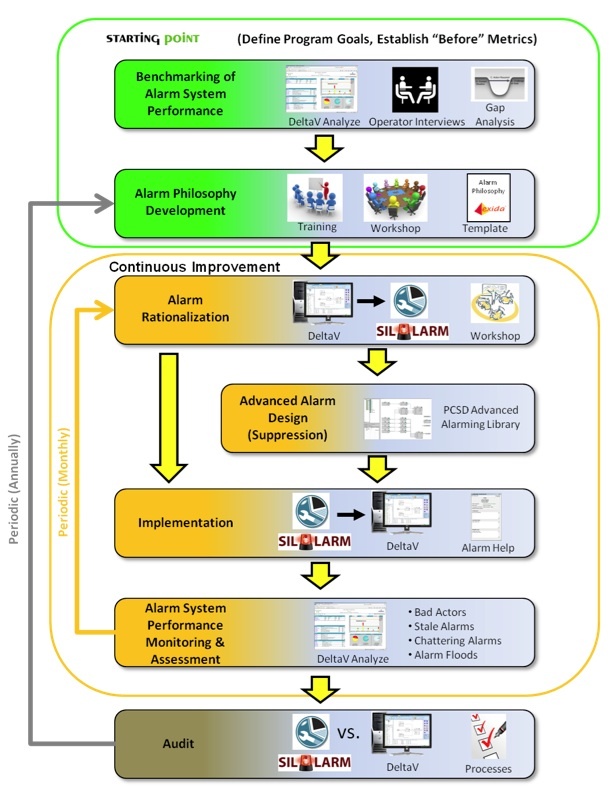 It provides an overview of the entire alarm management lifecycle so students can see how rationalization fits into an effective alarm management program. The class also discusses considerations for how to create an alarm philosophy document by reviewing some of the key topics that should be contained in this document. exida’s SILAlarm™ tool, which is an Emerson Process Management Solution Alliance product for alarm management, will be used to guide the participants through the rationalization process and capture the results. The seminar focuses on how to create an effective, sustainable alarm management program for DeltaV systems that delivers quantifiable benefits and complies with the ISA-18.2 alarm management standard. It prepares participants to support a facility alarm management program including tasks such as creating an alarm philosophy document, alarm rationalization, analyzing alarm system performance, alarm system maintenance and resolution of alarm management issues. The seminar includes a discussion of how to leverage the DeltaV alarm management tools (DeltaV Analyze, Alarm Help, and SILAlarm™) as part of an alarm management continuous improvement program.